BUDAPEST, HUNGARY. 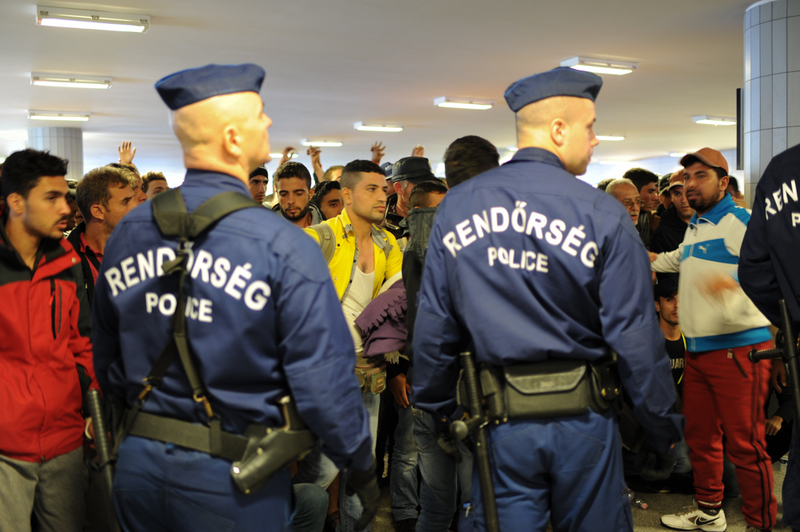 Police block the front of the line as refugees wait to board trains to Vienna before embarking onward to Germany, Switzerland and Sweden in the Keleti Train Station lower level on September 12, 2015. Hungarian officials have struggled to control the flow of refugees through their country, building a wall at its borders, multiple refugee camps and ultimately attempting to prevent stampedes to board trains by those who made it all the way to Keleti Station in Budapest and the nationalist Prime Minister Viktor Orban has faced tremendous international criticism but no public condemnation in the process for his words and deeds.